Plus – take a look at the FREE Bonus Offerings Below!! The Best Exacta/Trifecta/Superfecta Selection Software we’ve ever published! No Handicapping or Thinking Involved – Just Make the Suggested Wagers! Race 4 – $3.80 win $12.60 ex. Race 6 – $4.80 win $29.60 ex. We first introduced Jerry Howell’s Astro-ToteBoard Strategy in 2004 (paper & pencil). Were we skeptics? You better believe it!! But when we examined the results, we were surprised, or ‘flabbergasted’ may be a better word, at the incredible prices realized from a system that had little or no handicapping logic to it. Then, a couple of years ago, we published Jerry’s Astro-Certain Software which allowed the program to do all the figuring and it was a huge hit, making ‘believers’ out of many, many skeptics that winners and winning exotics could be selected with no handicapping. To do this Jerry developed his ‘Rotation’ Theory, which has a basis in Numerology, but he refined it to match seasonal ‘cycles’ he had researched. A simple explanation of this complex subject is that it is very similar to a ‘form’ cycle in racing, where horses go in and out of form. In the practice of Numerology, certain numbers ‘rotate’ into and out of favor, and Jerry’s formulas catch these trends. The program provides you with the numbers to play in qualified races (field size must be 8 horses or more) – suggested ‘boxes’ for Exactas, Trifectas and Superfectas. And the fact that most tracks offer .10 Supers and .50 Tri’s allows players with even a modest budget. Race 3 $4.60 win $40.20 ex. Race 5 – $9.60 win $44.00 ex. Race 10 – $8.20 win $34.20 ex. Dozens and Dozens of Superfectas, Trifectas, High Paying Exactas, a couple Super Hi 5s and often, very often, if there is a big-priced winner, you will find that horses among the numbers. Below a couple more full card results – and, again, you can expect this kind of consistency on most cards you play. 5 – $5.20 win $44.60 ex. 8 – $9.80 win $46.20 ex. 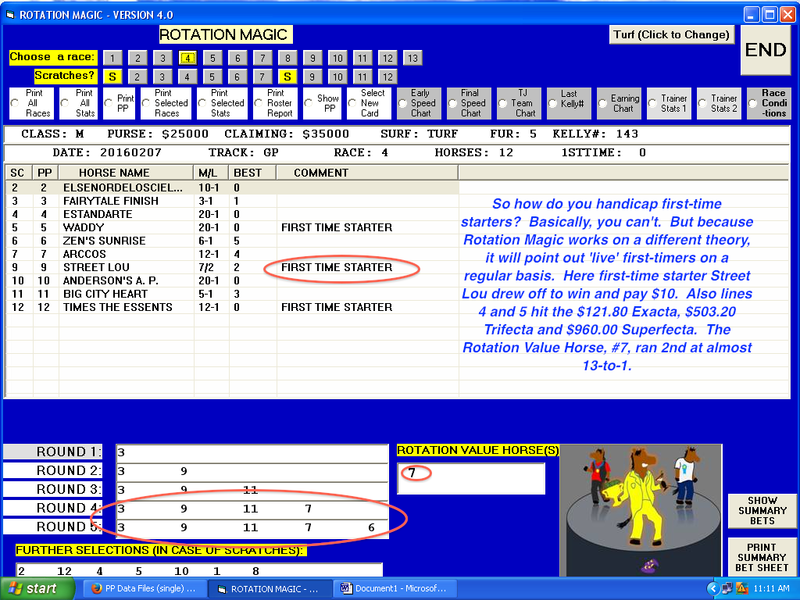 & the New TurnTime-Plus Software Program!, which puts a new and Lucrative spin on Pace Handicapping. That’s $132 retail worth of Top-Drawer Handicapping products at NO EXTRA CHARGE! And, they are yours to keep even if you decide not to keep Rotation Magic!! 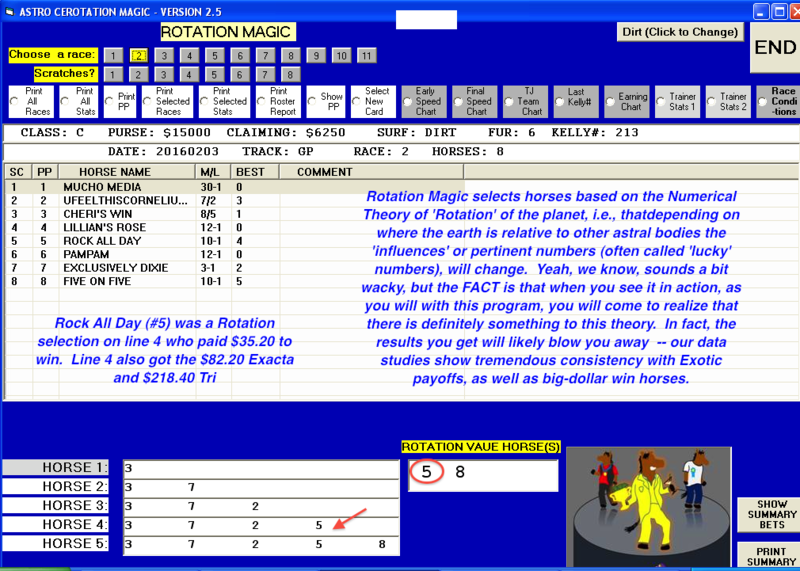 **For those of you who long to hit those giant payoffs track pros are raking in, the Astro-Rotation Software will get you there! At just $138, you will have your purchase price back and then some after your first hit or two, even betting minimum amounts!